Read Mind on Movies review of THE NUT JOB 2, in theaters August 11th. The gang is all back and this time they need to stop the Mayor." 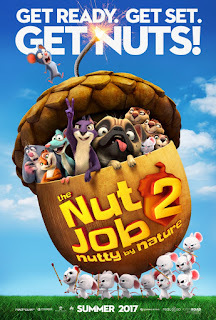 The Nut Job 2 follows Surly (voiced by Will Arnett) and his animal friends as they attempt to thwart Oakton City’s greedy mayor from destroying their home, Liberty Park, and turning it into a disastrous amusement park. This movie did have many slow parts and seemed to be all over the place plot wise. The film started off with one obstacle for the animals before moving on to the next problem and the next problem without fully settling the first problem. There also weren’t very many comedic one-liners, which was kind of a disappointment considering the film starred several comedians (Maya Rudolph, Bobby Moynihan, and Gabriel Iglesias). I’m sure the main reason there weren’t many laughs for audiences in this film was because of all the many problems and obstacles for the animals which really just gave the film a melancholy atmosphere that eventually made me a little sleepy. However, I did enjoy the vivid animation and the action was nice to watch. The good thing about this movie was that it didn’t really require you to have seen the first film to know what was going on in the second. That’s not very surprising considering this was a kid’s film, but it’s still nice to see for a sequel. I was slightly worried I would be confused the whole time when in reality, it didn’t matter if I saw the first film or not. My one warning to parents considering taking their kids to this movie is that there are many “action” scenes which may come off as slightly violent. There weren’t any bloody images obviously and the movie is PG, but just prepare for scenes of “dynamites in mole holes” and “buildings collapsing” in case you thought this was going to be a movie about animals skipping through fields holding pest exterminator’s hands. 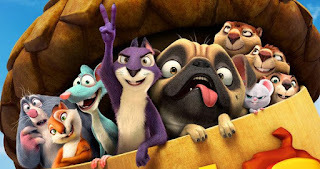 Overall, The Nut Job 2 just lacked the comedic quality I was expecting out of a typical animated movie. It wasn’t completely unbearable to watch, but it also wasn’t something I’d volunteer to watch again. But at least the animals were cute to watch... just don’t let Jackie Chan the mouse hear you say that.